Michigan Fingerstyle Guitar Society will be presenting Steven Bennett in concert this weekend. If you have not heard him it is a rare treat. 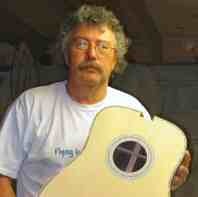 Steven is a master of the harp guitar and 6 string acoustic and a all round nice person both on stage and face to face. If you are located near Detroit it is worth attending. Fred, so how was this show? I wanted to go but was out of town. I have seen a few events at that venue. They get some amazing talent there. In case you haven't seen, Chris Smither tickets for The Ark in April are on sale now.